In a past blog, I discussed altruism and how people or businesses take advantage of media and self-promotion while doing something for their community. With the recent storm of ice water dumping individuals on the web, I thought perhaps we could take this discussion even further and discuss narcissism. In a world of ever increasing types of social media (i.e. Facebook, Twitter, Instagram, Snap Chat, and yes, Blogs to name just a few) we are inundated with the ability to promote ourselves in the public eye. Add to that the almost endless “Reality” TV shows from “Naked and Dating” to “16 and Pregnant” to “Nanny 911” and you have to wonder if our society hasn’t taken narcissism a step too far. In an article written by Chris Baraniuk for the BBC, he quotes Michael Hogan of the UK’s Telegraph in regards to the ice water euphoria on the internet, “It’s social media exhibitionism, more about attention-seeking than philanthropy,” and he may not be wrong. Many of the celebrities who have joined have often forgotten to even mention the non-profit organization they were contributing to, and many of the people who participated knew next to nothing about ALS and their work. But is narcissism in the name of charity a bad thing? Altruism is doing something good for sake of doing something good. But as long as good is done, does it matter the reason? In an article written by Lisa Firestone for the Huffington Post, she questions if social media is truly to blame for the narcissistic tendencies we see in youth today. The generation born between the 1980’s and 1990’s has been dubbed the “Generation me” with their all too common response to doing the right thing, “What’s in it for me?” And Firestone believes that parents are at least in part to blame. This may end up being a discussion of which came first; the chicken or the egg? Has parents and schools desire to keep children from disappointment (all kids make the team ideology) created a generation of children that actually lack self-esteem and so make up for this by consistently posting positive things about themselves on social media for the world to see? Quite possibly. Or, has the growth of multi-media like YouTube allowed our society to put ourselves on the front page of every computer screen across the globe created a society of fame seekers? Is there a balance between connecting through multi-media and bragging? There is a huge push for writers to utilize social media and connect with their audience. The idea that you need to “be in the public’s eye” without turning your achievements into bragging rights isn’t always a clear and easy line to see. So how do you temper self-promotion for your work without it becoming narcissistic sounding? It’s not easy. A NY Times piece called Of Myself I Sing by Teddy Wayne suggests that narcissism, at least in the beginning, isn’t necessarily a bad thing. Narcissism breeds self-confidence and that brings with it opportunity. However, over time it can become annoying to others and detrimental to relationship building. There doesn’t seem to be a clear cut answer as to how to promote yourself without coming across as narcissistic. In his article, Wayne quotes Rebecca Makkai, a fiction writer, on how she tries to balance out the two, “My personal standard is, is it something people need to or want to know?” she said, citing information like public appearances. Other ideas include promoting someone else on your page, being honest about problems and frustrations or provoking a conversation. The question all comes down to “why.” Why are you videotaping yourself dumping ice water on your head and plastering it all over Facebook? What good does it do other than get you so many “likes” on your page? Is donating to a charity of your choice and doing so without blasting it all over social media any less philanthropic? What emotion are you trying to invoke with your postings? Narcissism seems to be the norm today, whether it was started with parents, encouraged in schools and promoted with multi-media is to be debated for years to come. For better or worse, we are likely to see this behavior continue as we learn to balance the need to impress others with our need for privacy. I LOVE this, I am so quiet when I read about “charity” and I bite my tongue so much that it is a wonder I have one left at all to speak with when I do elect to voice my opinion. But YES! 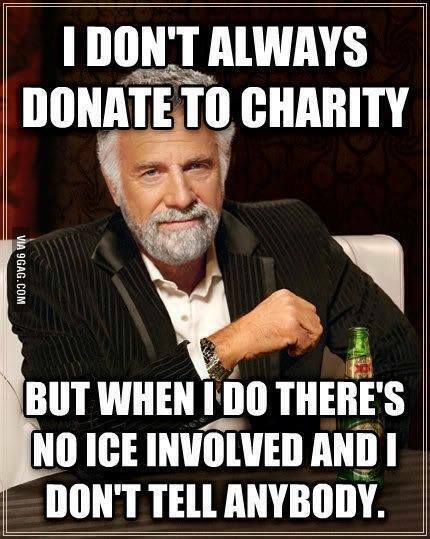 And YES once again to the most interesting man in the world! Correct! I worked for fundraising charity events and it was a nightmare extraordinaire and I have the utmost respect for people who give and then are known as Anonymous. Great post and important topic. Most of the money “raised” in narcissistic fundraisers like everything else narcissistic goes into a disordered pool and does little to create order or harmony, but then again helping others for whom you have no empathy wasn’t the point of the fundraiser. What you describe is not narcissism. Millenials are no more narcissistic than any other age. One really must be an adult to even be diagnosed as a narcissist right? If you saw a real narcissist, you would know it. Maybe not right away, but I think you would eventually. Narcissism in the psychoanalytical point of view would be more extreme. However, many professionals agree that today’s young adults expose much more of their personal lives on social media than older generations. Perhaps they have become more accepting. I see shows like the Kardashians and worry that we are way too public with things that should be more private. And we have become to see this as the norm. Sometime a little anonymity goes a long way. Well older people didn’t have social media, so they were not born into that generation. Plenty of older generations use it however. Would you say that they are narcissists when they show every afghan they knitted, or all their crafting projects, or every picture of their grandchildren. How ever much I think the Kardashions are putting their private life if public, I think the benefits of social media are huge. I think I may have not realized you were using narcissism out of context. Social media brings people together who may otherwise not have the chance to socialize. The dumping of water for ALS only raises awareness it is not meant to irritate. it is a cause, is nor different than walking for a cause.